Jeremy Seabrook is the author of more than forty books on subjects as diverse as transnational prostitution, child labor, social class, ageing, unemployment and poverty. 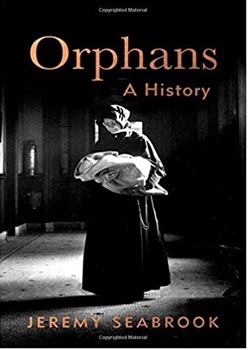 His latest book is Orphans: A History(Hurst, 2018). The separation of children from their illegally migrant parents in the USA is seen as an aberrant and inhumane deviation from American tenderness for the family. This orphaning, as a matter of policy, is not “who we are,” as many liberals and some conservatives despairingly say. But in many ways it is, and indeed, has long been. For the state, in the United States and earlier in Britain, has been a formidable creator of orphans. Perhaps this helps to explain the ambiguity in the attitude to the orphan: great display is made of theoretical pity and piety, but the way such children have been actually treated has frequently been punitive and repressive. Whether in orphanages, asylums, schools or other receptacles for those guilty of losing their parents, the extent of abuse by those in whose power such unfortunates have fallen is only now becoming clear. Whatever charitable sentiments are kindled by the plight of orphans, such compassion has rarely prevented countries from the making of yet more of them by failing to wage war, or even to prevent it in those places – Syria and Yemen – where the indiscriminate harvesting of human life yields its sorry crop of abandoned children. But it has not required war for governments, charities and even private individuals to rob children of their parents. From the first time a ship sailed from London to Virginia in the early 17th century taking “a hundred children out of the multitude that swarm about the place” until the last forced child migrants from Britain to Australia in 1967, thousands of young people were orphaned, not only of parents but of all ties of kinship, country and culture. The orphans sent from Britain to Australia alone numbered some 180,000. Transportation removed 50,000 felons – among them many juveniles – by transportation to the American colonies; and in the process robbed many more children of at least one parent. In the 1740s, recruiting agents in Aberdeen sowed fear by luring children to service in the plantations. Peter Williamson and his companions, shipped to Virginia in 1743, were sold for sixteen pounds each. In 1789 the first convict ship, the Lady Juliana, consisting entirely of transported women and girls, set sail for Australia. The historical fate of a majority of orphans is unknown. Many were taken in by kinsfolk or neighbors, and while many must have been fostered out of duty or affection, others were certainly used as cheap labor, for whom their foster-parents were accountable to no one. It was not until the industrial era that the policy of removing children from their parents in the interests of society became widespread. The Poor Law Amendment Act permitted parishes to raise money to send adults abroad. One of the Assistant Commissioners claimed that “workhouse children had few ties to their land, and such as there were could be broken only to their profit.” In 1848, Lord Salisbury also advocated emigration for slum children. Annie McPherson, Quaker and reformer, was the first private individual to organize mercy migrations, the rescue of children from their “gin-soaked mothers and violent fathers.” She set up a program of emigration in 1869. Dr Barnardo used Annie McPherson’s scheme, before implementing his own in 1882. He referred to “philanthropic abduction” as the rationale behind this disposal of the offspring of misery. At the same time, “orphan trains” carried children from New York and Boston to the open plains of the West, under the auspices of the Children’s Aid Society, established in 1853 by Charles Loring Brace. Sometimes children were “ordered” in advance, others were chosen as they left the train, or paraded in the playhouses of the small towns where farmers could assess their strength and willingness to work. These “little laborers” responded to a shortage of workers on farms. Between 1854 and 1929 a quarter of a million children were dispatched in this way. In Britain, what were referred to as “John Bull’s surplus children,” were promised a future of open air, freedom and healthy work. Some were undoubtedly well cared for; but others exposed to exploitation, life in outhouses and barns, freezing in winter, stifling in summer, isolation and deprivation of all affection. The proponents of such schemes argued that this would provide them with a fresh start in life; but the cost of a one-way journey to Canada was far less than their maintenance by payers of the poor-rate. In 2010, the then British Prime Minister Gordon Brown apologized for the removal of children from their parents under the Fairbridge scheme, which took them to Australia, a practice which continued into the late 1960s. In 2008 Kevin Rudd, then Premier of Australia, apologized to indigenous families whose children had for generations been removed. In 2013 the Irish Taoiseach apologized for the abuse of orphans and illegitimate children by the Magdalene laundries from 1910 until 1970. It is in this context that former Attorney General Jeff Sessions declared zero tolerance of illegal immigration in April 2018. All such people would be prosecuted. Families were broken up, because detention centers were “unsuitable” for children. In June, after harrowing scenes of forcible separations, Trump signed an executive order that families should be kept together. All children under five were to be reunited with their families within 14 days, and those over five within 30 days. It might have been thought that the creation of orphans by government had been consigned to history. Was it amnesia or dementia that made the administration, in its determination to be tough on illegal migration, separate parents from their children in its retreat to a tradition of punitive indifference to the most vulnerable? And then, what of the orphans of addiction, of mass incarceration, the abductions of the offspring of the marriage of technology with commerce, orphans of the gun-fetish and the multiple social estrangements created by social media and the engines of fantasy which lure children from their parents, protectors and guardians? The orphan-makers have never been busier in this era of wealth and progress.